An untamed wolf can be dangerous but the pups are as adorable as any pet animal and this Wolfpack Pays slots game gives a glimpse how this clever wild animal plays its moves to survive. Well, the game is a 5 reel with 243 different ways to win and has an amazing background view of mountains and rocks near a river that get you closer to nature. Orchestra music adds more glory to the scene and wonderful theme. The betting limit is very reasonable with a minimum of £0.30 and a maximum being just £45 that makes this game suitable for beginners and occasional game players. The developer is Microgaming, a recognisable brand name when it comes to online casino gaming that has been in the industry for about 23 years now. It has over 600 games across its network enjoyed by users around the world. 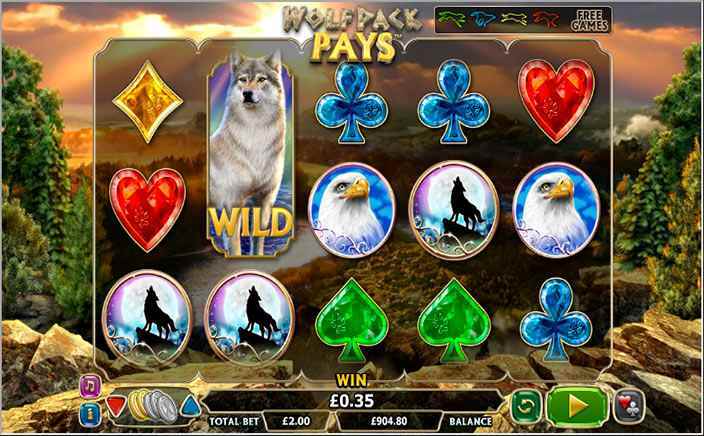 Wolfpack Pays slots is a very simple game with just four high-value symbols; a wolf, pups, a family of deer by the river. Wolf is the high paying symbol with 20 times the stake on 5 appearances in a row. There are three bonus symbols represented by an eye of the wolf inside a jewelled oval frame and the game logo. These two scatter and will features respectively. ● Wild Symbol: The Wolfpack Pays game logo is wild and it covers for all the symbols except the scatter and award you with 50 times the stake when five of them appear during a spin. Four symbol appearances will give 25 times your stake and the entire reel will stick as wild for the next four spins, increasing your chances of winning some easy money. ● Scatter: The eye of the wolf in a frame is the scatter feature and three or more symbols awards you with 10 free spins. Five scatter symbols also get you high stake wins of 750 times your bet amount along with the free spins. ● Running Wilds: This is a bonus feature that gets activated during free spins and on each spin, the wild stack grows one per reel until the end of free spins. 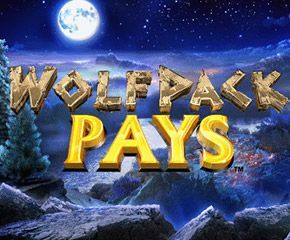 What makes Wolfpack Pays slots one of the best slot games is its simplicity and lower amount bet limits that prevents you from huge losses of high stake slots.